Fitting system for RIB seats has been pull tested with a 112cm RIB seat, in-vehicle, to the latest EC safety standards at STATUS Lab and witnessed by TUV Deutschland. It passed with a rock solid performance. The test was done using a RIB seat with a slider mechanism fitted as this makes the seat heavier & the test forces are higher giving you even greater confidence. Produced in the UK by an ISO9001 Certified Manufacturer. This means that quality is built in to our systems and manufacturing controls at every stage of the process. The under floor reinforcing system is manufactured from unusually thick steel & is formed into a non-standard box section profile so that it fits between the floor of your van and the spare wheel. Powder coated during assembly for long life protection and includes corrosion resistant zinc plated fixings. 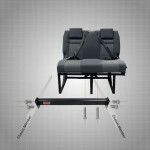 IMPORTANT NOTE: the RIB Fitting Kit is specifically designed to work with seats supplied by Banwy & Kiravans. If you have a seat from another supplier it is very likely that the legs & mounting holes are not in exactly the same location. In which case you need to check the measurements before drilling lots of holes in your van floor. The Installation Kit includes all the high-tensile steel nuts, bolts & washers you will need to complete your installation. 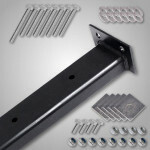 Bolt the under floor bracket to your chassis (exact locations are defined in the instructions). 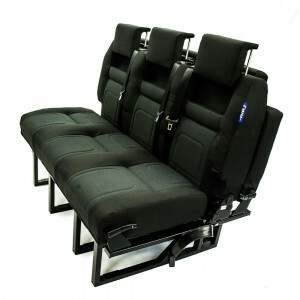 RIB Seats have 2 sets of front mounting holes - so that long and short length beds are equally straight forward to fit in both SWB and LWB models. 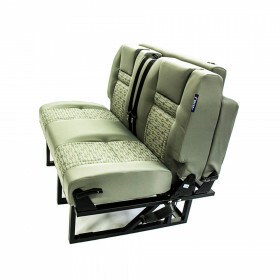 All kits come with a certificate to prove that you have used a tested system to fit your seat into your campervan. IMPORTANT NOTE - THE KIT CAN ALSO BE USED FOR OTHER SIZED BED BUT IT IS LIKELY THAT YOU WILL NEED TO DRILL THE HOLES IN THE APPROPRATE PLACE. SAME GREAT KIT JUST A LITTLE EXTRA EFFORT ON YOUR PART.